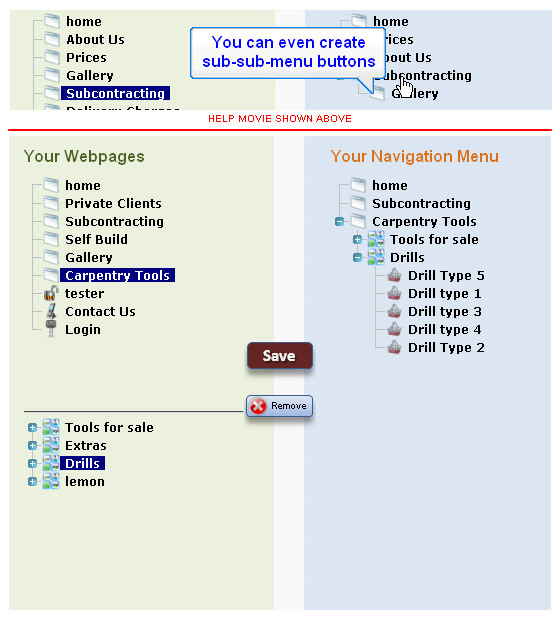 As you create more and more webpages or even groups of items for sale you may wish to create multi-level buttons. You can now setup a simpler and more structured way to navigate your clients to the pages or items that interest them. To start just click the Organise Pages link in Step3. You will immediately be shown the main drag and drop screen similar to that shown below. Remove page from the menu. Drag your popular items onto the main menu bar, reducing clicks and improving sales. Just drag the webpages you have built from the left side to the right side and click the [SHOW ME] button. As soon as you click the button, you can see the changes live, instantly on your website. The new drag and drop system is fully compatible with the Reason8 customised button tools.